This small volume is devoted to one of the most common patient complaints encountered by practitioners of adult medicine, and one that frequently presents the initial examining physician with a diagnostic conundrum. Few internists, primary care physicians, emergency room physicians, or medical or surgical subspecialists are thoroughly familiar with the neurologic, orthopedic, immunologic, and vascular causes of leg pain, and help from the literature requires access to multiple texts from diverse medical and surgical specialties. 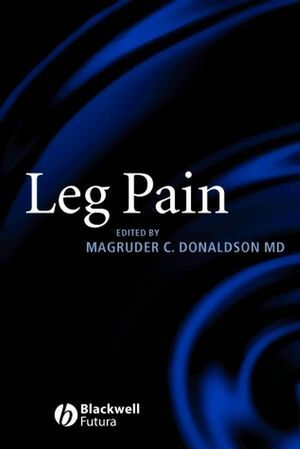 Leg Pain brings together, in a compact and easily transportable volume, expertise from the fields of vascular surgery, neurology, orthopedics and rheumatology, to offer insights into the clinical signs and symptoms associated with leg pain of diverse origins. · Emphasizes distinguishing features of the various types of leg pain, most of which can be determined by a simple history and physical examination. · Much important data are presented in tabular form to aid in arriving at a correct diagnosis. · Contains practical illustrations including a large section showcasing normal anatomy of the lower extremity. Foreword- John A. Mannick, M.D..
Chapter 2. Pathophysiology of Leg Pain. Chapter 3. The Initial Encounter. Chapter 4. Mechanical Leg Pain. Tamara L. Martin, M.D. and Scott D. Martin, M.D..
Chapter 5. Inflammatory Leg Pain. Sang Cheol Bae, M.D. and Matthew H. Liang, M.D..
Chapter 6. Vascular Leg Pain. Chapter 7. Neuropathic Leg Pain. Chapter 8. Other Leg Pain. Appendix: Normal Lower Extremity Anatomy.